Detroit may be famous for coney dogs, Faygo pop, and Better Made potato chips, but in recent years, this city has proven that it can serve up more than just your standard American fare. Down-home BBQ is one of many cuisines that has taken off in metro Detroit, proving that we are a city with talents that exceed sports and car manufacturing. Most Detroiters know about Slow’s in Corktown, which has become one of the fastest-growing BBQ spots in the area. People flock from far and wide to get a taste of their pulled pork sandwiches, mac and cheese, and juicy, fall-off-the-bone ribs. While Slow’s shouldn’t be too worried, they do have some competition out there. To name a few, we have Red Smoke in Detroit, Lockhart’s in Royal Oak, Zeke’s Rock and Roll BBQ in Ferndale, and my most recent BBQ discovery, The Union Woodshop in Clarkston. may be a hike for some, this spot is well worth the trip. It’s family friendly, with a spacious, wooden interior. The main level has plenty of seating and a more relaxed atmosphere. The upstairs is where the fun begins. You can hang out a the bar, peruse around their store where they sell knick-knacks and books, or play some foosball and bowling. While waiting for a table usually is a yawn-worthy experience, the Union Woodshop provides plenty of entertainment for guests. By the time you get seated, hopefully you’ll be very, very hungry. The portions are generous here, so make sure your appetite is in check. The Union Woodshop’s menu has everything from your standard BBQ fare to wood-fired pizzas and as-big-as-your-head burritos, with tempting appetizers like the “burnt ends” and fried pickles. 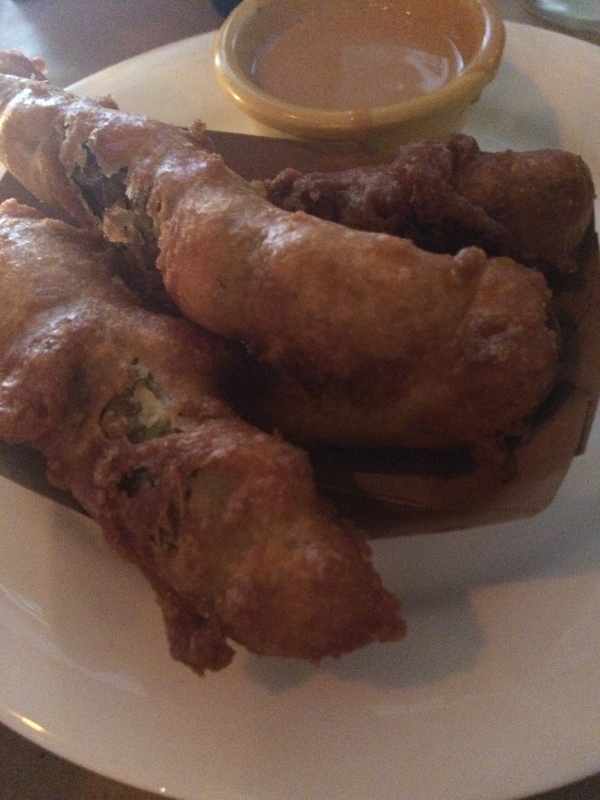 You just can’t go wrong with fried pickles. While just about everything on the menu appealed to me, I opted for a traditional BBQ meal, which was out-of-this-world. The baby back ribs were so tender and delicious, with just the right amount of seasoning and not a whole lot of sauce. I would go as far as to say that they have addictive properties. Along with the ribs, I opted for a side of mac and cheese, which had a beautiful golden-brown topping with creamy, cheesy penne noodles underneath. I don’t think mac and cheese can get much better than this. 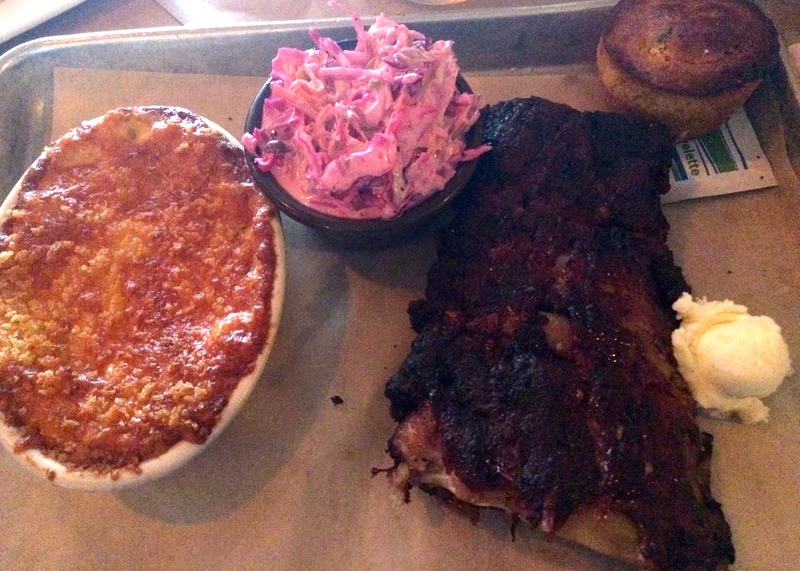 The coleslaw was the only aspect of the meal that didn’t “wow” me. I liked the use of purple cabbage, but the flavor and creaminess was a little over-the-top for my taste. However, the added bonus of jalapeno cornbread that came with my meal definitely made up for it. Somehow, miraculously, I was able to save a bit of room for dessert, and I am so glad that I did. 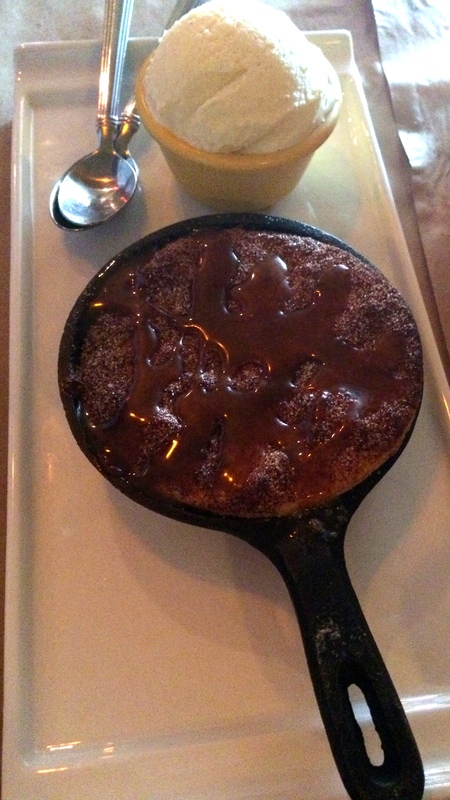 The “Brownie Pot Pie” went above and beyond my dessert expectations. I don’t think I have ever had anything THIS good. It makes you feel like you’re doing something extremely naughty, yet it’s just so satisfying. My experience at the Union Woodshop was unforgettable, and I couldn’t stop raving about it after (and I still am to this day). BBQ is definitely not my favorite cuisine of all time, but this place made me want to drive back the next week for more! Hours: Mon. – Thurs. 4 p.m. – 10 p.m., Fri. 4 p.m. – 11 p.m., Sat. 12 p.m. -11 p.m., Sun. 12 p.m. – 9 p.m.
Click here to view the Union Woodshop’s cool website and menu! Wow, I’ve got to try this place. Thanks for another upbeat, informative review.